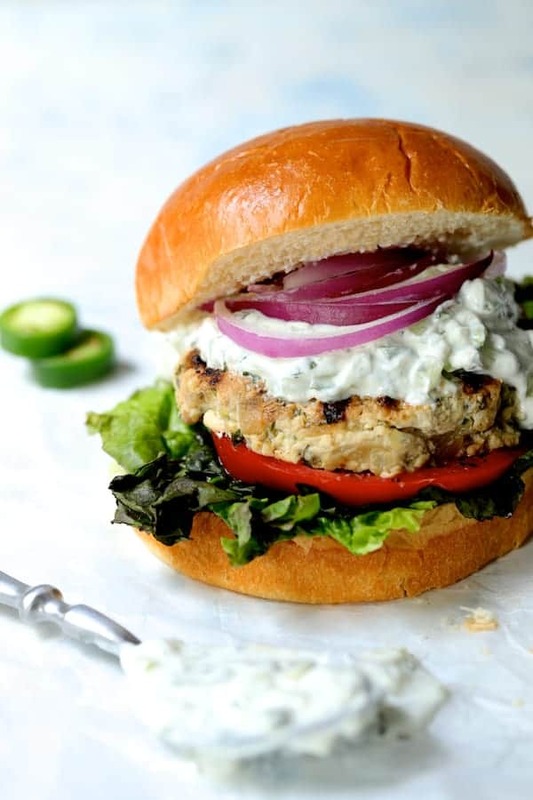 Chicken Zucchini Feta Burgers with Jalapeno Tzatziki are a tasty and healthful way to spice up your summer burger routine! Can you believe how fast summer is going by? I truly don’t know where half of it went and we’re already harvesting butternut squash from our garden! There are still so many summery recipes I want to make before the leaves fall. This one has been on my summer list to create for a while and I’m happy to say it’s a new favorite of ours! We don’t use ground chicken for things very often but whenever we do, I’m always so glad. However, it has to be the “right” chicken. One thing that always makes me a little apprehensive about ground chicken is I’ve got a super-sensitive palate when it comes to anything “off-tasting.” It would be nice to just pick up a pack of ground chicken at the grocery store but in all honesty, whenever I’ve purchased those 1-pound plastic sealed containers, I’ve not been able to use it. I don’t need to get into detail but just let me say that I highly, highly recommend getting freshly ground chicken (and turkey!) if you can. I’m a huge fan of The Fresh Market so I always get it from there. It’s always freshly ground that day and I can request all white meat, half white-half dark or all dark meat. Always be sure to use any freshly ground meat or poultry within a day or so. 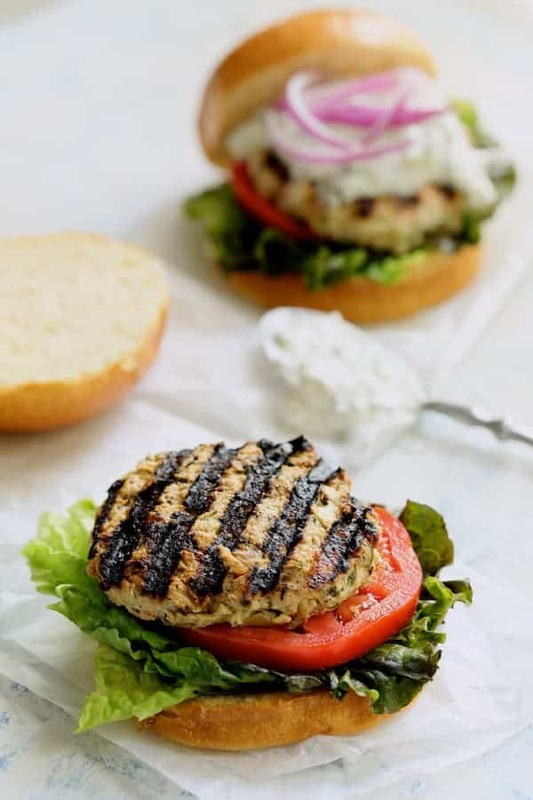 To bump up the flavor of the chicken burgers starting on the inside, saute a small onion in olive oil first. Shred a medium zucchini and add it to the onions along with some garlic and give it a quick stir to soften it. Remove from the heat and add some dried or fresh oregano and a pinch of cayenne. Let that cool. Stir in a good heaping cup of crumbled feta cheese and some salt and pepper. 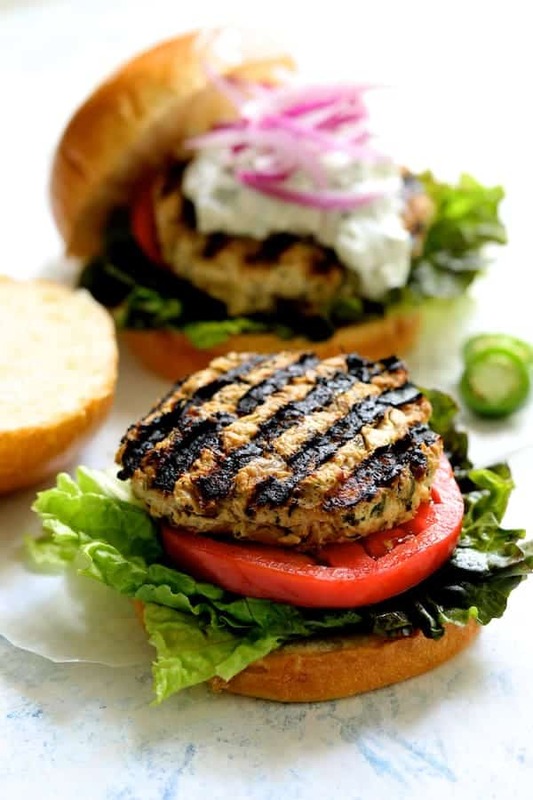 Add to the ground chicken, mix it up then form into burgers. 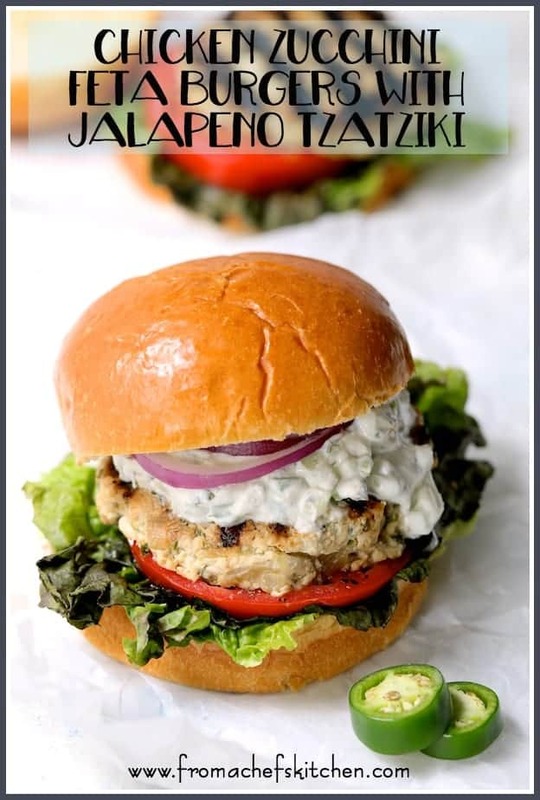 Mix up the jalapeno tzatziki. 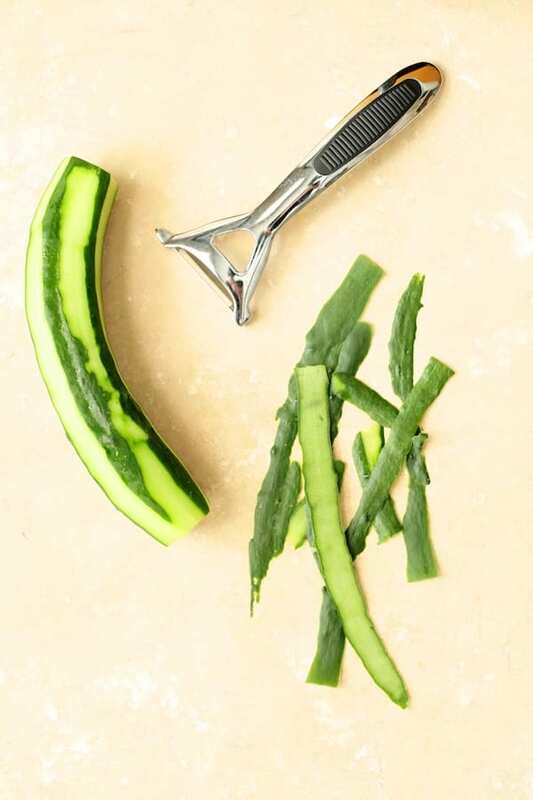 For the cucumbers, I like to peel thin strips from most of the cucumber. I find the cucumber peel can be a little tough sometimes but I don’t like to remove it completely because of the nutrition in the peel. This way they also look very pretty in salads. 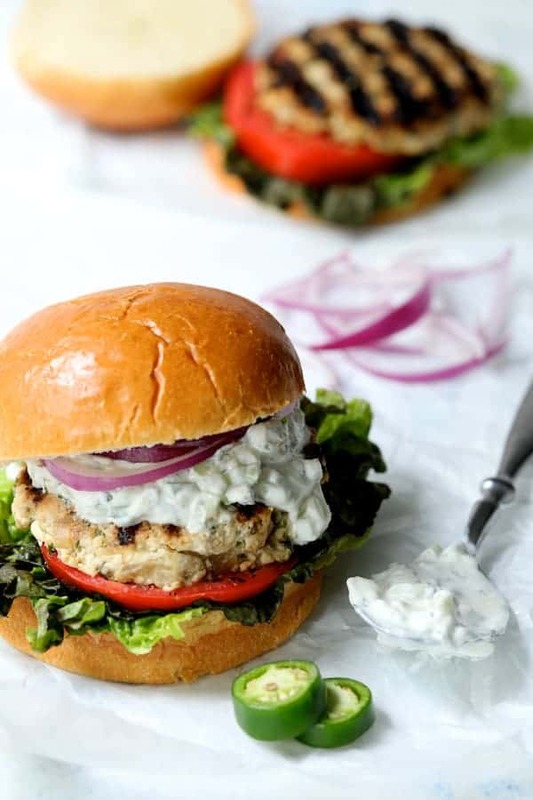 Serve on buttery, brioche buns with lettuce, tomato and red onion for a super tasty, Greek-inspired, lighter and healthier burger! Delicious! And I love these soft, buttery brioche burger buns from The Fresh Market, too! 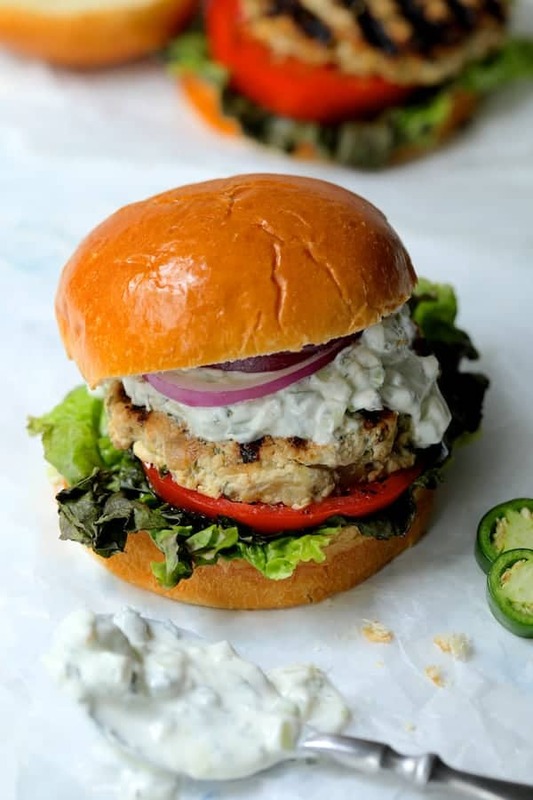 Be sure to check out my other great burger recipes! BURGERS: Heat olive oil in a small skillet over medium-high heat. Add the onion, reduce heat to medium and cook 7 to 8 minutes or until softened. Add the zucchini and garlic and cook 1 to 2 minutes or until zucchini is softened. Stir in oregano and cayenne pepper. Remove from the heat and let cool 10 minutes. Transfer to a bowl. Add feta cheese, salt, black pepper and chicken. Form into 6 even burgers. Preheat a grill to medium-high heat. Place burgers on the grill. Grill 4-5 minutes on each side or until a thermometer inserted in the center registers 165 degrees. 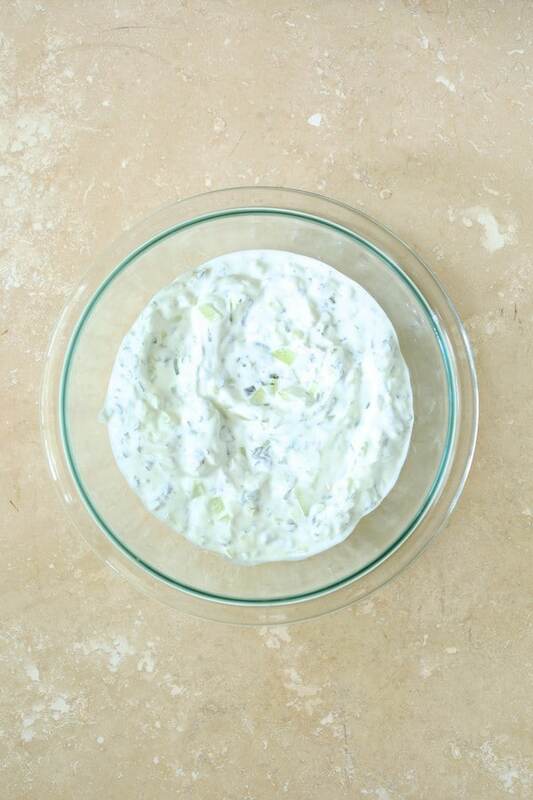 TZATZIKI SAUCE: Combine all ingredients in a bowl. TO FINISH: Serve burgers on brioche buns. Toast or grill if desired. 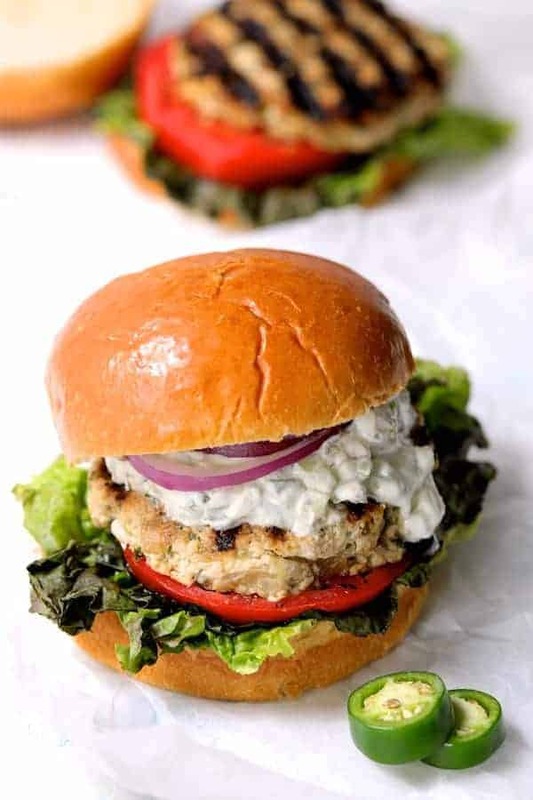 Add lettuce, tomatoes, red onion and tzatziki as desired. Devour.